While on our vacation excursion into the hinterland of Minnesota and Wisconsin, we happened upon quite a few bookstores. Darn. Hence, our car was more heavily laden coming home. One amazing bookstore that we found was in Duluth, of all places. It's on the main street that runs west to east and is in an old church. The entire inside of the church, from narthex to nave to choir loft is full of bookcases carefully loaded alphabetically with rare and remarkable books, grouped within the bays and ranges by topic, authors and genre. 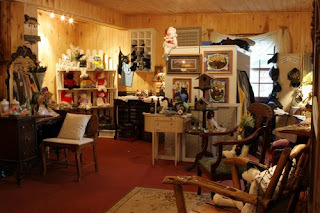 In addition, there are many antiques that make the place have a very musty, comfortable feel to it. Definitely worth another visit. The most significant thing about this particular vacation, however, was that I actually had time to read and relax. I used to be a voracious reader, but with life taking some twists and turns, and raising a family and working several jobs, opportunities to read and the ability to keep my eyes open when I had such opportunities meant I rarely could finish a book in a week. But on this vacation, Donna deliberately scheduled day after day where we simply relaxed. We read in deck chairs at the beach, on our cabin 's deck, and in grassy parks. It was wonderful. My reading choices were very diverse. If you've seen our collection, you will understand our dilemma of deciding what to read. But I almost randomly picked some recent acquisitions and set about digesting the tomes. First, The Disappearing Spoon by Sam Kean, a writer for the journal Science. The book is about how each of the elements in the periodic table were discovered, and anecdotes about their discoverers. It's very interesting, but it tends to paint science in a very bad light, with infighting, politics, and egos getting in the way of good science. Scientists are human, after all. The most off-putting thing about the book is Kean's attitude. He comes across as a know-it-all, and virtually sneers at those foolish scientists who delved into alchemy, cold fusion and “pseudoscience” while nevertheless making major chemical breakthroughs. Next, John Irving's A Prayer for Owen Meany. Donna's been after me to read this for years, and I simply haven't been motivated to read the whole thing. She said it is on her top ten favourites, and I couldn't figure it out. I keep picking it up and reading a few pages, but it never has grabbed me. So, I set my sights on finishing the damn thing. And you know what? It's great. I still say the movie (Simon Birch) was very good, even though it cherrypicked scenes from the story and called it quits by about a quarter of the way through the book. Irving's book is a brilliant work of writing, and even qualifies as a fantasy/SF novel. Next, Phoenix Without Ashes, by Harlan Ellison and Ed Bryant. The best part of this book is Ellison's epilogue, in which he tells the true story of how Hollywood ruined his story idea and created probably the worst science fiction TV series in history. Boy, was Starlost bad. So bad, that Ellison insisted his name be removed from the credits. I also read Science Was Wrong by Stanton Friedman and Kathleen Marden. Interestingly, this book wasn't in the UFO/paranormal section, where the rest of Stan's books are located. It's found in “science,” which is appropriate, since it's about controversies in science, such as global warming, AIDS, aviation and genetic manipulation, but there's one chapter on UFOs and one on parapsychology thrown in for good measure. Of note is that Friedman's version of the cold fusion story is a bit more objective than Kean's, which is mostly ridicule. I also read a smattering of books by Kevin Randle, Stan's – uh – friend and colleague in the Roswell UFO crash dialogue. Randle's book Crash is just out, listing and describing most of the known UFO crash stories, of which there are dozens. 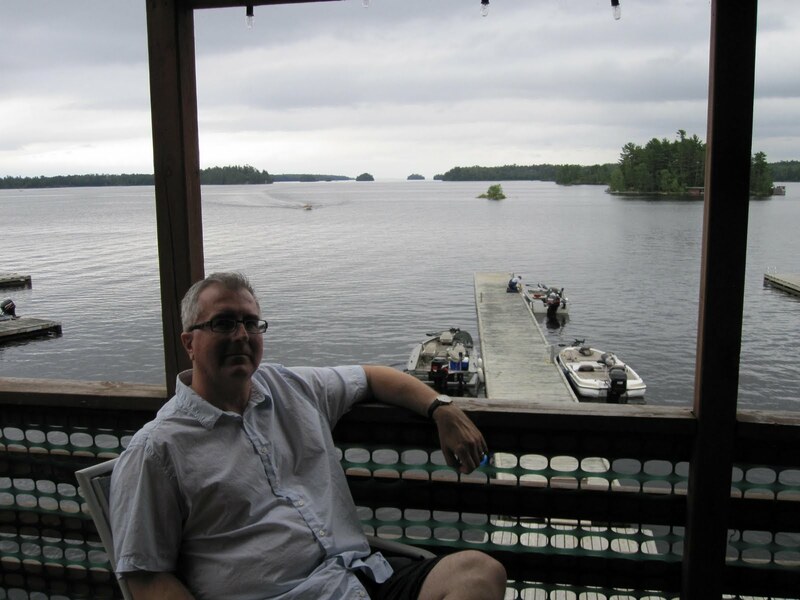 As with most compilations of things, the book doesn't include several UFO crash cases of which I'm familiar, including the Clan Lake and Etzikom cases, although there are sections on the Shag Harbour incident and a recent non-UFO crash event for which Randle asked my opinion and gave me a nice shout-out. Randle is also an SF author (yes, he really does have more than 100 books published), and I got his set of The Exploration Chronicles from him at the 2009 MUFON Conference in Denver. The set of four books is composed of: Signals, Starship, FTL and The Gate, chronicling the progress of human space exploration and development. The series spans many generations and years of human progress, if one can describe it as such. It's actually very pessimistic and paints humanity in a dismal light, with constant battles between scientists and nearsighted politicians and bureaucrats. It's a wonder that we make it off the planet at all. It seems very realistic and possible. Something that struck me while reading the series is that Randle is a UFO investigator and believes strongly that alien civilizations are out there and may be visiting us. Yet his SF series about human exploration of space and contact with aliens, while good reading and very plausible, portrays our venture into the universe as an extension of our progress in the 20th Century. Talk about depressing. Meanwhile, SF authors like Arthur C. Clarke and Isaac Asimov, who painted vivid tales of interstellar voyages, human/alien interaction and fantastic trips through time and space, were UFO debunkers, seemingly unable to even consider the potential of possible alien contact with humans today. Yes, we made it back, and with stories to tell. Once again, we decided to go on a "Fortean Tour" for our vacation this year. After much web browsing, book scouring and pamphlet poring, we set out on our trip into the American midwest. Out east from Winnipeg on a morning threatening rain, but nothing manifested. We passed through Falcon Lake, the site of the classic 1967 UFO landing; you can take a horseback "UFO Tour" to the landing site, guided by someone from the Falcon Lake stables. And t-shirts commemorating the event can be bought in the town's grocery. Having been there several times, this was not on our agenda, however. We took the north bypass around Kenora, where we were almost immediately wiped out by a semi that was passing a slow-moving car by driving in our lane of oncoming traffic! I had to veer onto the shoulder to avoid collision. The Trans-Canada in Northwestern Ontario is definitely as dangerous as its reputation has it! Back on the highway until we reached Fort Frances, ON, and International Falls, MN, a twin town that straddles the border. We can verify that as we were told, the area smells awful, the pulp mills brewing up some seriously noxious odours. The border crossing here is on a bridge. It was about a half-hour lineup to get through customs. Curiously, you can walk on a footbridge to go across for the day, commuting between the two towns being so easy and economical. 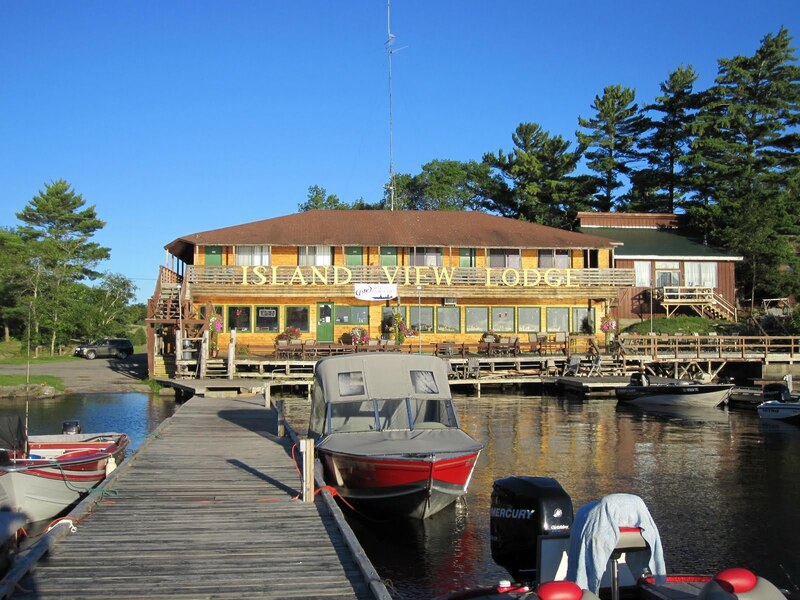 Once across, we quickly sped east to the Island View Lodge, a fishing resort that is frequented almost exclusively by those wanting to catch "the big one." I say "almost" because we were there to catch a glimpse of something else: the Island View ghost! The story we heard was that the ghost of a former owner was haunting a cabin at the lodge. We didn't want to make any inquiries too early, else someone might deliberately give us our money's worth! 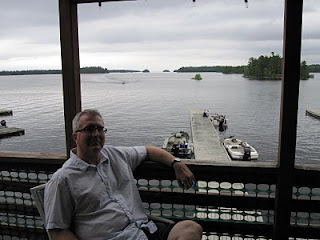 Fortunately, we were there for a vacation too, and took advantage of the gorgeous weather and our deck overlooking the lake to do some reading a enjoying the fresh air and scenery. 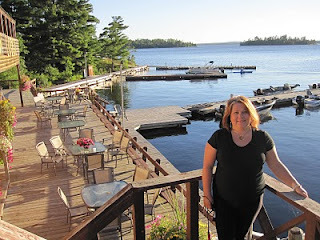 The lodge has a restaurant overlooking the lake, so we went there for dinner and were pleasantly surprised to find it's fantastic! Donna had a duck with wild rice and I had prime rib with walleye fingers (didn't know they had fingers, did you? ), and a bottle of champagne. The dining room, overlooking the lake. The Madame posing on the resort's deck. Me, being all relaxed and stuff. After dinner, we asked our waitress about the ghost and she was very helpful. She brought out a clipping from Minnesota Moments magazine from 1993 in which stories of the ghost were recounted. According to locals, the ghost is that of Bob Cole, the former owner who died many years ago. Ever since then, many people have had experiences with poltergeist-like effects. A long time ago, someone had been working on a truck's engine and had given up on it at last, because its parts were so corroded and rusted. Suddenly, all by itself, the motor one day started up and ran until the puzzled mechanic stopped it. Of course, the motor never ran again. Many employees at the lodge have been victims of a playful ghost. Once, a bartender had been using a bottle opener very often one night, having to retrieve it every so often from a hook on a wall. At the end of the night, he couldn't find his keys to the cash register, so he said out loud, "Okay, Bob, help me find my keys!" Suddenly, he heard a jangling of keys behind him, There they were, on the hook behind the bottle opener! We then began calling out for Bob to appear or give us a sign he was around, to no avail. Only one person has seen the ghost. As we were staring to check out the next morning, we asked the lodge manager about the ghost. She said that she had seen it once, when she had forgotten something at the reception desk late at night, and rather than turning on the light she just carefully want downstairs. She was shocked to see a ghostly-white figure standing in the gift shop, hovering in the darkness. The Gift Shop, where the ghostly figure was seen by the manager. The manager fled upstairs in a hurry. She also said that the odd phenomena seem to center on herself. She said that "things happen around me." She said that every time she walks into the bar, the blender turns on by itself! I received a report about a UFO that broke into pieces over Montreal early this morning. Observed by several persons and QPP (Quebec Provincial Police) officers, that a single object of a red colour and a blue ring descended at [to?] about 50 metres and several objects [indecipherable] in several directions. 1 object however split in[to] several objects at around 50 metres from ground and a blue colour [was observed?]. The police officers reported no smell of burning was observed [detected? ], but all the objects reunited and left. The police officer has observed this phenomenon and several people [have the] same story. Seemed like a simple fireball or bolide case, but the line that threw me was that the objects "reunited and left." I would hope some additional information will be forthcoming on this one. Late Friday night, July 9, 2010, I received a call from a man who excitedly told me about the white fireballs he and three others had just seen over Winnipeg. At about 11:55 pm, he and some friends were outside enjoying the warm summer night when they all saw a bright object in the southern sky, in the direction of the airport. He said they saw it zip westward quickly, leaving a bright trail and perhaps even some sparks. This sounded like quite a nice bolide. But then, he said a second identical object appeared a few minutes later, following the same path. This would be very unusual for bolides, but not unheard of. I made an appeal on radio for additional witnesses and I contacted some news reporters to see if anyone else had reported something similar, to no avail. Over the last 48 hours, NUFORC has received almost 100 similar reports of very peculiar events, which have been witnessed across the U. S. and Canada on July 4th, and perhaps on July 3rd, as well. The sightings are a phenomenon for which we have no ready explanation. Many of the reports from both days have been submitted by seemingly serious-minded individuals, many of whom apparently witnessed the events with multiple other witnesses present. are similar, in that the witnesses have described seeing strange red, orange, or yellow ‘fireballs,’ which have been seen either to hover in the night sky or to streak overhead, sometimes individually, and on some occasions in clusters. In some instances, the objects were observed against a clear, cloudless sky, and in other cases they were observed below solid cloud cover or in broken overcast conditions. I've been puzzling over these BOLs (balls of light) for years. In most instances, they are obviously bolides, satellites or high-flying aircraft. However, I'm getting more and more reports of BOLs which seem to make right-angle turns, travel one way and then make U-turns, and are motionless than accererate out of sight. Most of the UFO reports received are simply too incomplete to assess. Joliet, Illinois, July 9, 2010, Approx. 11:00 p.m.
My wife, her daughter and her friend were at Chicagoland speedway last night about 11:00 o'clock pm, we started seeing orange lights in the sky coming from the south. First there was 1 then 2 then 3. They would disappear and reappear in a different location. Sometimes closer or higher. The 4 of us watched this for about an hour. When we were leaving, I saw a formation of 5 white lights in an arrow formation with something behind them. It wasn't a plane that I know of or a helicopter or stars or planets. Harrietsfield, Nova Scotia, July 9, 2010, 10:40 - 10:45 p.m. I was looking out my window and looked up and saw an orb of light floating just above the trees. It was coming from the west, headed east and I kept my eyes on it until it appeared to just fade away into the horizon over the Atlantic Ocean. It was truly amazing. I don't find the latter one particularly amazing, but that's just me. Notice how the UFO is called an "orb," which automatically means it is mysterious and otherworldly. It was a distant light, "just above the trees," which to experienced investigators simply means that it was low to the horizon and likely was dozens of miles away. A quick check of several flight trackers showed that the light could have been any one of at least half a dozen commercial aircraft flying in or out of Halifax, or several airliners overflying the area on the way to Europe. Or not. As for the Chicago area case, how many more aircraft are in that area at that time of night? And the formation? How close of a formation was it? A few degrees of sky or 20 or 30 degrees? I sure hope that the investigator remembered to get such details, otherwise the report is of little use to ufologists. As for those BOLs which seem to make right angle turns or reverse direction, one possibility is that the witness is watching a satellite that enters the Earth's shadow and thus disappears, coincidentally at the same time another emerges, or a high-flying aircraft becomes illuminated. Of course, not all BOL reports are as easy to come up with possible explanations for. I'm simply urging caution when labeling all BOLs and lights and orbs as "mysterious." UFOs, yes, certainly. Alien spacecraft, probably not.